So, this is one of my other favorite things to do with salmon. 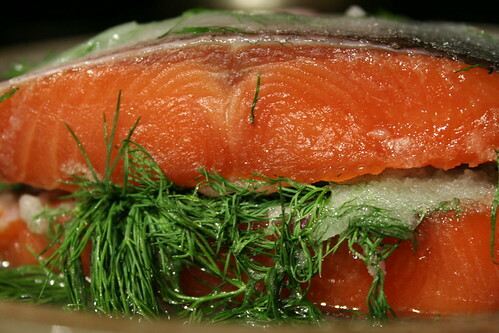 Gravlax is basically cold cured salmon, and the recipe originated in Scandinavia, where so many of the interesting ways of preparing fish come from. Start with a couple of small fillets. I usually use coho, but this year I saved a couple of fillets off of my spring chinook instead, since I couldn’t wait for coho season to have some of this delicious treat. 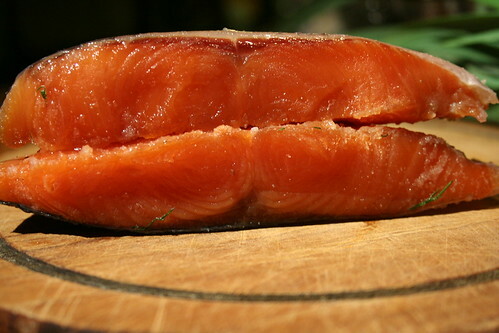 I freeze the fillets for a few days to kill any parasites, since gravlax does not involve any cooking of the fish. Thaw out your fillets and then rub them down with a light coat of olive oil, probably not an original Scandinavian ingredient, but what the heck. Then I usually rub them down with a little scotch whisky, but this time I used a little sake, since I am all out of good scotch. I usually grind a little bit of pepper on the fillets too. Then mix up a cup of non-iodized canning salt and a cup of sugar, and put a thin layer of this in the bottom of a glass dish or pie pan. Lay the first fillet on this salt sugar mix, skin side down, and coat it well with more of the sugar/salt mixture. Put on a layer of thin slices of red onion. 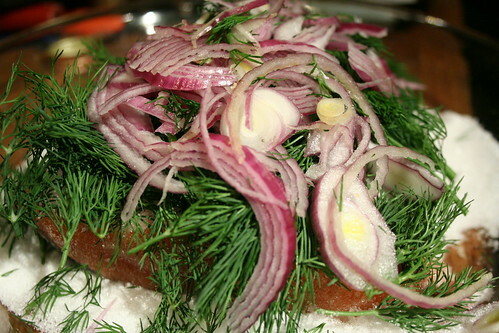 Cover that with a handful or two of fresh dill, and then another layer of onion slices. Coat the other fillet with the sugar/salt mixture and lay that on top, skin side up, and then use the rest of the sugar/salt mixture to cover everything well. Cover it up and put the whole thing in the fridge, after admiring your work of course, and maybe having a shot or two of the scotch. Twelve hours later, pull the dish out of the fridge. There will be a lot of brine now in the dish, from all the moisture that the salt has pulled out of the fillets. Using a spatula, turn the whole thing over, so the top fillet is now on the bottom. Use a spoon and pour the brine all over the whole assembly, admire your work again, and maybe repeat that scotch thing, too. Then return it to the fridge for another 12 hours. This is what it looks like after 12 hours. When the second twelve hours is over, pull it out again and separate the fillets. 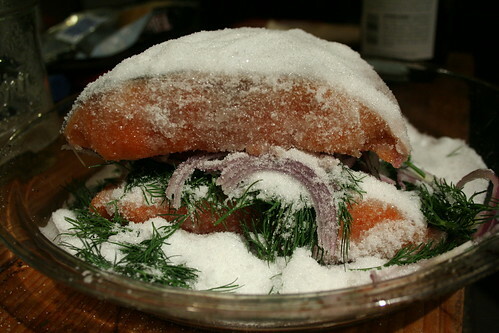 Scrape off all of the salt and dill and onion, and wipe the fillets down with paper towels. Now they are ready to eat. Take thin slices off, at a shallow angle, and put them on rye crackers, with cream cheese and slices of fresh red onion, or toast, or bagels, or whatever you like. In the Sunset Magazine fish cookbook, where I first learned how to do this, there is a recipe for a delicious mustard sauce that you can put with the fish as well. Bon appetit! You have just taken a couple of small salmon fillets, and a few dollars of other ingredients and made it into a delicacy that sells in the fancy delis for $30/pound or more, and yours is going to taste a lot better!